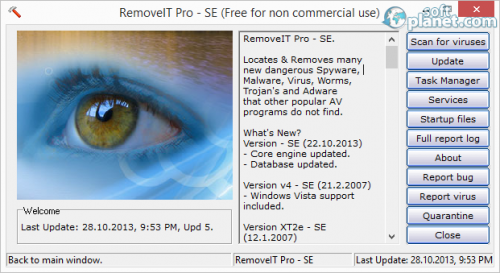 SoftPlanet makes it possible for everyone to get free RemoveIT Pro download directly from our servers. There is no registration needed for downloading. Viruses and malware that you may encounter while scouring the Internet or installing apps that come with dangerous software programs are one of the biggest threats that you might meet for your computer. That's why every computer needs an antivirus application, but some are heavy on the resources of your PC and others want payment. 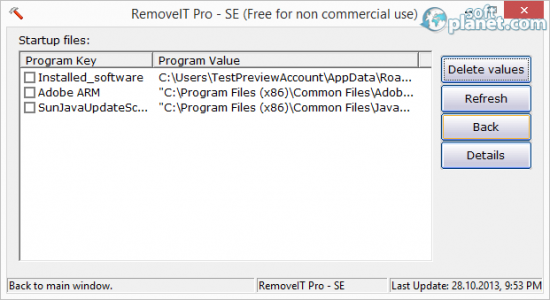 RemoveIT Pro is none of the above, but the free version is limited, because if a virus has stuck in your operating system the free-to-download version can't remove it. If you want to remove this limitation and to get your hands on the more capable Enterprise version you must pay USD 15.00. RemoveIT Pro scans for viruses in a very fast manner, even though it performs the scan one file after another. But this ensures that all the files will be checked and you will be safe from Spyware, Adware, Worms, Trojans, Malware and Viruses. The app offers to put into quarantine all the files that it finds that are dangerous to your operating system so that you can be sure that they will not harm your software. There is a reason why RemoveIT Pro boasts of its simplicity and the most obvious one is its interface. It is very simple and you don't have to wander around complicated tabs and menus. There is a main screen that contains information about the app and several buttons which activate the most important functions of the application. The buttons that can be activated from the main screen are Scan for viruses, Update, Task Manager, Services, Startup files, Full report log, About, Report bug, Report virus, Quarantine and Close. All of them lead to the corresponding function and there are no glitches in using them. When the scan of the hard disk has finished the program found 3 files that had viruses on our test computer. Two of the files were part of the system and that's when RemoveIT Pro informed us that to delete them it needs the Enterprise version. That is a bit suspicious and also annoying, because you know that you can't remove these files except with special programs. But if you want you can download Free File Unlocker, a program that will delete all files that you point out. RemoveIT Pro may be a simple app with a simple interface, but at the same time it is quite capable, and also free. There are some limitations in the free version, but if you buy it they will be removed. 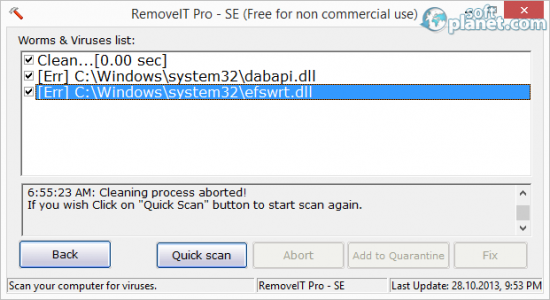 Our security scan shows that RemoveIT Pro is clean from viruses. The current version of RemoveIT Pro has been scanned by our system, which contains 46 different anti-virus algorithms. That ensures that RemoveIT Pro 4 is 100% safe for your computer.